You'll be £4.99 closer to your next £10.00 credit when you purchase That Astonishing Infantry. What's this? The Royal Welch Fusiliers were present at all Marlborough's great victories; they were one of the six Minden regiments; they fought throughout the Peninsula and were present at Wellington's final glorious victory at Waterloo. In The Great War their officers included the writer poets Siegfried Sassoon and Robert Graves; their 22 battalions fought not just on the Western Front but at Gallipoli, in Egypt, Palestine, Salonika, Mesopotamia and Italy. In WW2 they won battle honours from the Reichswald to Kohima. More recently they have served with distinction in the war against terror in the Middle East. Like so many famous regiments the RWF are no longer in the British Army's order of battle having been amalgamated into the Royal Regiment of Wales. But this fine book is the lasting memorial to a fiercely proud and greatly admired regiment. 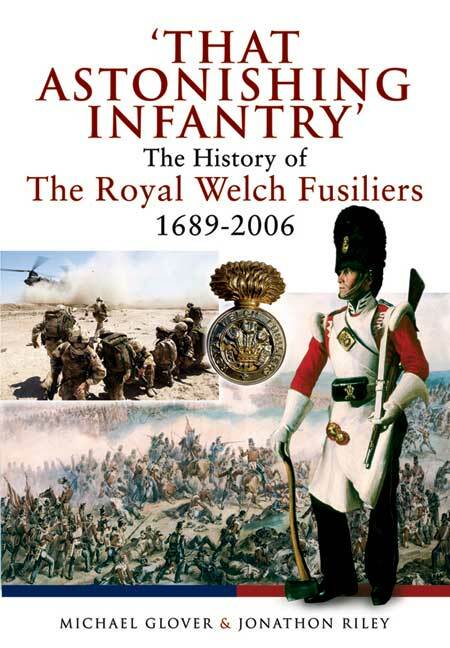 exceptionally well illustrated... classic regimental account... very highly recommended.